A multi-track MP4 means that the video extension is MP4 format and the video contains multiple subtitle and audio streaming tracks. A DVD video usually includes English, Chinese, Spanish… several language streaming. 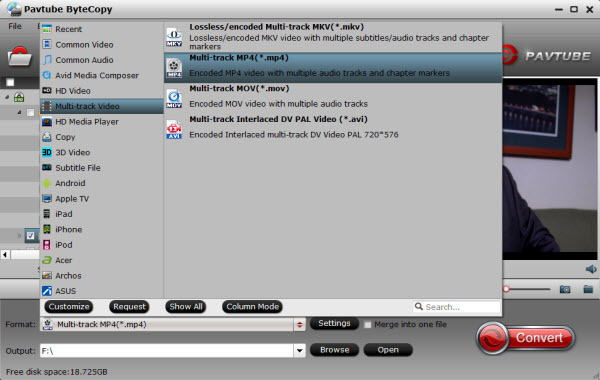 Ripping DVD to multi-track MP4 can preserve all or several subtitle and audio tracks. Then you can watch the multi-track MP4 DVD rips on TV via Plex with your preferred subtitle and audio track and can switch to another track anytime as you like. So how to convert DVD to MP4 with multiple subtitle and audio tracks? To get the goal, you need to get a DVD Ripping software that can keep multi-track subtitle and audio streaming. In the market, there are many DVD Rippers but few multi-track DVD Ripping tool. Fortunately, Pavtube Bytecopy can help you copy DVD to multi-track MP4 with subtitles and audio. It is special designed for users to rip Blu-ray/DVD to MKV/MOV/MP4 with multiple audio and subtitle tracks for your Plex/TV streaming. Moreover, it’s also a professional Blu-ray/DVD ripper, allows you to rip and convert Blu-ray/DVD discs to any other video format you like such as converting DVD to AVI, WMV, FLV, TS, etc. Intimate is, there are many optimized presets for tablet and smartphone, including Kindle Fire HDX, Google Nexus 6P, Galaxy S7, iPad Pro, Surface Pro 4, Xbox One S, PS4 Pro, etc which will give you best video quality. Mac version is also available: Pavtube Bytecopy for Mac. How to Copy DVD to Multi-track MP4 for Plex/TV? Step 1. Free download and install Pavtube ByteCopy on your PC. Insert DVD disc to your ROM, click “Load files” to import DVD disc directly from ROM. If you have IFO/ISO and DVD folder, choose the corresponding option to load DVD movies from your computer. The main title in your DVD will be checked by default; so let’s move on and choose format. Click the “Settings” button to check all video&audio settings. By default it will check all the audio tracks (languages), so if you only need some of the languages, just check the unwanted ones. Don’t forget to click OK to confirm all the changes. Click the big red “Convert” to start converting DVDs to MP4 with multiple languages. The original DVD chapter marker will be kept automatically. After conversion, hit the “Open” or “Open output folder” icon to quick locate converted MP4 videos. Then, you can put the MP4 files into the sharing folder of Plex then streaming on HD TV. This entry was posted in Backup, MP4, Plex, TV.